This is another movie I have seen before, but it has been a long time since I watched it in its entirety. 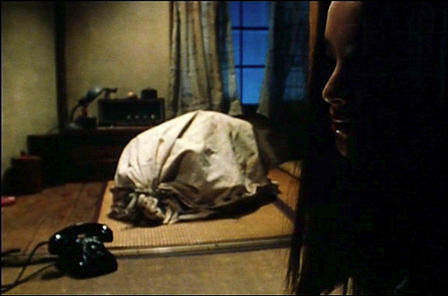 Takashi Miike, the director, tends to have very confusing films, and Audition is probably the most accessible to new audiences. Despite the fact that this is one of his easier to comprehend films doesn’t mean it’s easy to follow and answers all the questions you had, but compared to most of his other movies, this might as well be as tame and cookie-cutter as a Matthew McCounaghey romantic comedy. You can’t Google image search this movie without this picture coming up, so I will save you the effort. We open with a wife dying in a hospital as soon as her young son walks in, which is a bummer. We flash forward seven years to see the husband, Shigeharu, played by Ryo Ishibashi, being lonely and depressed while taking care of his son. Since he works in the movie industry, he decides to hold an audition for a future wife, under the guise of auditioning for a movie, so he is able to select girls who have certain skills and talents. One in particular catches his eye, Asami, played by Eihi Shiina, and he decides to pursue her. I know what you’re thinking. You’re thinking there is something totally normal in that bag, aren’t you? Things seem to be going well, and Asami has no idea what Shigeharu is after, and they start a relationship. After sleeping together, Shigeharu wakes up to find Asami missing, with no indication of where she went. Shigeharu starts investigating Asami’s references from her audition resumé and starts noticing discrepancies and mysterious things in her past. Whether it be people not existing, disappearing, or being murdered, things just aren’t adding up. That is, until one night Shigeharu goes home and is drugged by Asami, who then begins to torture him for what he did and the whole fake audition. Okay, you dragged it out of me. The torture culminates with the classic “spitting in someone’s mouth”. I won’t go into too much detail of the events of the torture, but it isn’t pleasant. It involves needles, aprons, and razor wire. Maybe aprons don’t sound painful, but let’s just say it got messy at times. And things obviously get a little more complicated when Shigeharu’s son walks in. I also don’t want to spoil the ending, and that’s for two reasons. One reason is that the movie follows a pretty traditional linear story, with an introduction/hook/rising action/etc., and at the end, there are a few twists that make you question what has actually happened. The second reason is that I am not actually sure I understand the twists, so I will leave the end result up to you. Some kids have dogs, some kids have cats, some kids have tongue-less amputees. I wouldn’t necessarily say this movie was mind-blowing or anything like that, but if you are looking for a good film to watch by Takashi Miike, I can’t recommend this one enough. That could be because it is the most “Americanized”, but it also could be the fact that this guy makes multiple movies a year. I get the sense from his films that he will get a few good ideas about a film and strike while the iron is hot, rather than saving those ideas until he can work them all into one movie. I completely understand doing this, but it sometimes means that his movies have just a couple of interesting scenes, while the rest falls flat. Also, considering his reputation for gore and everything gruesome, I would say this is one of his more tame films. Yes, the torture is pretty uncomfortable, but you understand it’s coming up and can look away, whereas a lot of other movies have violence without much warning and you have seen it before wishing you hadn’t.